The game in Sao Jose was quite interesting. 7th ranked Botafogo F.R. (7-11) played at the court of eighth ranked Sao Jose (7-10). Sao Jose managed to secure a 7-point victory 79-72 on Monday. Sao Jose looked well-organized offensively handing out 23 assists. Worth to mention a great performance of Douglas Nunes (208-87) who helped to win the game recording 16 points and 7 rebounds. Argentinian point guard Fabian Sahdi (186-89) contributed with 10 points and 6 assists for the winners. Sao Jose's coach Paulo Cezar Martins used a ten-player rotation which allowed the starters a little rest for the next games. Forward Arthur Bernardi (206-90, college: Houston Baptist) answered with 14 points and 7 rebounds for Botafogo F.R.Sao Jose moved-up to sixth place. Botafogo F.R. at the other side keeps the seventh position with 11 games lost. They share it with 3 other teams. Sao Jose are looking forward to face league's leader Pinheiros in Sao Paulo in the next round and it will be quite challenging to get another victory. Botafogo F.R. 's supporters also look forward to an exciting derby game next round, where their team will face at home their local rival from Rio de Janeiro Vasco Da G.. Important game to mention about took place in Brasilia. Thirteenth ranked Brasilia (5-12) saved a 2-point victory at home edging higher ranked Corinthians (7-11) 84-82 on Thursday evening. It was a great evening for the former international point guard Welington Dos-Santos (185-81) who led his team to a victory scoring 21 points and 9 assists. Zach Graham helped adding 24 points. At the losing side American-Peruvian point guard Kyle Fuller (185-92, college: Vanderbilt) responded with 28 points. Both coaches used bench players in such tough game. Brasilia moved-up to twelfth place, which they share with Vasco Da G. Corinthians at the other side keeps the seventh position with 11 games lost. They share it with 3 other teams. Brasilia will play against higher ranked SKY/Basquete (#11) in Aldeota in the next round and it will be quite challenging to get another victory. Corinthians will have a break next round. A very close game took place in Belo Horizonte between Minas and Paulistano. Tenth ranked Minas (7-11) got a very close home victory over higher ranked Paulistano (12-7). Minas managed to escape with a 3-point win 88-85 on Wednesday evening. It was quite big embarassment for the guest team. It was an exceptional evening for Wesley Ferreira who led the winners and scored 16 points and 6 rebounds. Leonardo Meindl came up with 19 points, 6 rebounds and 4 assists for Paulistano in the defeat. Both coaches tested many bench players in such tough game. Minas moved-up to seventh place, which they share with 3 other teams. Paulistano lost third consecutive game. They keep the fifth position with seven games lost. Both teams do not play next round, which will be an opportunity for some rest. The game between fourth ranked Vivo/Franca (14-2) and 7th ranked Paschoalotto/Bauru (7-11) in Sao Paulo ended with biggest points difference. Vivo/Franca beat guests from Bauru 88-71. Lucas Silva fired 25 points and 7 rebounds for the winners. Both coaches allowed to play bench players saving starting five for next games. Vivo/Franca have a solid series of four victories in a row. Defending champion moved-up to third place. Paschoalotto/Bauru at the other side keeps the seventh position with 11 games lost. Vivo/Franca's next round opponent will be league's second-placed Flamengo in Rio de Janeiro and it will be for sure the game of the week. In the last two games of round 19 Corinthians beat B.Cearense on the road 90-77. Flamengo won against Paulistano on its own court 95-87. The game in Sao Jose was quite interesting. 7th ranked Botafogo F.R. (7-11) played at the court of eighth ranked Sao Jose (7-10). Sao Jose managed to secure a 7-point victory 79-72 on Monday. Sao Jose looked well-organized offensively handing out 23 assists. Worth to mention a great performance of Douglas Nunes (208-87) who helped to win the game recording 16 points and 7 rebounds. Argentinian point guard Fabian Sahdi (186-89) contributed with 10 points and 6 assists for the winners. Sao Jose's coach Paulo Cezar Martins used a ten-player rotation which allowed the starters a little rest for the next games. Forward Arthur Bernardi (206-90, college: Houston Baptist) answered with 14 points and 7 rebounds and Wesley Alves (198-96) added 13 points and 5 rebounds in the effort for Botafogo F.R.Four Sao Jose and five Botafogo F.R. players scored in double figures. Sao Jose moved-up to sixth place. Botafogo F.R. at the other side keeps the seventh position with 11 games lost. They share it with 3 other teams. Sao Jose are looking forward to face league's leader Pinheiros in Sao Paulo in the next round and it will be quite challenging to get another victory. Botafogo F.R. 's supporters also look forward to an exciting derby game next round, where their team will face at home their local rival from Rio de Janeiro Vasco Da G..
No shocking result in a game when seventh ranked Corinthians (7-11) beat 11th ranked SKY/Basquete (6-14) in Aldeota 90-77. It was a great shooting night for Corinthians especially from behind the arc, where they had solid 55.6 percentage. Uruguayan point guard Luciano Parodi (182-94) fired 24 points, 7 rebounds and 5 assists for the winners. 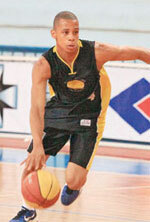 American-Peruvian point guard Kyle Fuller (185-92, college: Vanderbilt) chipped in 18 points. Corinthians' coach Bruno Savignani allowed to play the deep bench players saving starting five for next games. The former international forward Felipe Ribeiro (201-79) produced 17 points and 7 rebounds and American point guard Dontrell Brite (175-94, college: Mount Olive) added 18 points and 5 rebounds respectively for lost side. Five Corinthians and four SKY/Basquete players scored in double figures. Corinthians maintains seventh place with 7-11 record, which they share with 3 other teams. SKY/Basquete at the other side keeps the eleventh position with 14 games lost. Corinthians will have a break next round. SKY/Basquete will play on the road against Brasilia (#13) and it may be a tough game between close rivals. A very close game took place in Belo Horizonte between Minas and Paulistano. Tenth ranked Minas (7-11) got a very close home victory over higher ranked Paulistano (12-7). Minas managed to escape with a 3-point win 88-85 on Wednesday evening. It was quite big embarassment for the guest team. Minas looked well-organized offensively handing out 21 assists. It was an exceptional evening for Wesley Ferreira (201-95) who led the winners and scored 16 points and 6 rebounds. American swingman Dominique Coleman (198-88, college: Francis Marion) accounted for 22 points for the winning side. International Leonardo Meindl (201-93) came up with 19 points, 6 rebounds and 4 assists and Eddy Carvalho (196-87) added 20 points respectively for Paulistano in the defeat. Four Paulistano players scored in double figures. Both coaches tested many bench players in such tough game. Minas moved-up to seventh place, which they share with 3 other teams. Paulistano lost third consecutive game. They keep the fifth position with seven games lost. Both teams do not play next round, which will be an opportunity for some rest. Important game to mention about took place in Brasilia. Thirteenth ranked Brasilia (5-12) saved a 2-point victory at home edging higher ranked Corinthians (7-11) 84-82 on Thursday evening. Corinthians was plagued by 27 personal fouls down the stretch. It was a great evening for the former international point guard Welington Dos-Santos (185-81) who led his team to a victory scoring 21 points and 9 assists. American guard Zach Graham (198-89, college: Mississippi, agency: Pro Sports) helped adding 24 points. At the losing side American-Peruvian point guard Kyle Fuller (185-92, college: Vanderbilt) responded with 28 points and Uruguayan point guard Luciano Parodi (182-94) scored 14 points and 8 assists. Both coaches used bench players in such tough game. Brasilia moved-up to twelfth place, which they share with Vasco Da G. Corinthians at the other side keeps the seventh position with 11 games lost. They share it with 3 other teams. Brasilia will play against higher ranked SKY/Basquete (#11) in Aldeota in the next round and it will be quite challenging to get another victory. Corinthians will have a break next round. Rather expected game when 5th ranked Paulistano (12-7) lost to second ranked Flamengo (15-4) in Rio de Janeiro 87-95. Flamengo made 16-of-21 charity shots (76.2 percent) during the game. Argentinian point guard Franco Balbi (185-89) fired 19 points, 7 rebounds and 9 assists for the winners. The former international center Anderson Varejao (211-82) chipped in a double-double by scoring 19 points and 11 rebounds. International Leonardo Meindl (201-93) produced 16 points, 5 rebounds and 7 assists and international forward Renan Lenz (206-90, college: Utah) added 18 points and 8 rebounds respectively for lost side. Both teams had four players each who scored in double figures. Paulistano's coach Regis Marrelli rotated eleven players in this game, but that didn't help. Flamengo have a solid series of four victories in a row. They maintain second place with 15-4 record having just one point less than leader Pinheiros. Paulistano lost third consecutive game. They keep the fifth position with seven games lost. Flamengo's next round opponent will be Vivo/Franca (#3) in Sao Paulo, which may be the game of the day. The game between fourth ranked Vivo/Franca (14-2) and 7th ranked Paschoalotto/Bauru (7-11) in Sao Paulo ended with biggest points difference. Vivo/Franca beat guests from Bauru 88-71. Vivo/Franca made 18-of-20 charity shots (90.0 percent) during the game. International forward Lucas Silva (209-95) fired 25 points and 7 rebounds for the winners. American David Jackson (195-82, college: Penn St.) chipped in 12 points and 5 assists. Four Vivo/Franca players scored in double figures. The former international Jefferson Andrade (207-83) produced 16 points and 7 rebounds and the former international guard Alex Garcia (191-80, agency: Interperformances) added 18 points respectively for lost side. Both coaches allowed to play bench players saving starting five for next games. Vivo/Franca have a solid series of four victories in a row. Defending champion moved-up to third place. Paschoalotto/Bauru at the other side keeps the seventh position with 11 games lost. Vivo/Franca's next round opponent will be league's second-placed Flamengo in Rio de Janeiro and it will be for sure the game of the week. Power forward Anderson Rodrigues (205-PF-97) put on an extraordinary performance in the last round for Sao Paulo FC, receiving a Interperformances Liga Ouro Player of the Week award for round 13. The 21-year old player had a double-double of 19 points and 10 rebounds, while his team beat Rio Claro (#6, 5-7) 89-83. Sao Paulo FC is placed at 3rd position in Brazilian Liga Ouro. They would have been even better if they hadn't lost a few games earlier this season. Sao Paulo FC will need more victories to improve their 7-5 record. Rodrigues just recently signed at Sao Paulo FC, being already a very valuable addition to the team. Anderson Rodrigues averages this season 4.0ppg. The second best player in last round's games was 25-year old Patrick Vieira (186-PG-93) of Cerrado. Vieira had a very good evening with a double-double of 25 points and 10 rebounds. Bad luck as Cerrado was edged by the higher-ranked Campo Mourao (#2, 8-5) 91-88. This loss caused Cerrado to drop to 5th position in the standings. His team is not often considered as one of the league's best with a mere 6-7 record. Vieira is a newcomer at Cerrado, but is already one of team's top players. He belongs to the best scorers in the league with 23.2ppg (#1). His other stats are also decent: 7.3rpg and 4.6apg. Third on the list of top players last round was forward Everton Oliveira (203-F-93) of league's top team Londrina. Oliveira scored 18 points and grabbed six rebounds. Despite Oliveira's great performance Londrina lost 81-82 to #4 ranked UniFacisa. But his team cannot count on just a single player as he also needs help of the other teammates especially in such crucial game. The last thing Londrina needs is to lose another game like this one. They lose more and more distance to the top teams. Their record is 9 victories and 4 lost games. Oliveira has a very solid season. In 13 games in Brazil he scored 8.4ppg. He also has 6.4rpg and FGP: 61.4%. There will be only one (last) round of the Regular Season in Liga Ouro. Here is the last round review presented by ESL. The most surprising game was a loss of top-ranked Londrina (9-4) on the court of fifth ranked UniFacisa on Monday night. Visitors were edged by UniFacisa 82-81. It ended at the same time the two-game winning streak of Londrina. They outrebounded Londrina 37-22 including 25 on the defensive glass. American point guard Nate Barnes (178-90, college: Alders.-Broad.) stepped up and scored 21 points and 5 rebounds for the winners and his fellow American import forward Reggie Larry (198-86, college: Boise St., agency: Pro Sports) chipped in 13 points and 10 rebounds. At the losing side forward Everton Oliveira (203-93) responded with 18 points and 6 rebounds (perfect from the field making all eight shots !!!). UniFacisa (7-6) moved-up to fourth place. Londrina at the other side still keeps top position with four games lost. UniFacisa are looking forward to face Cerrado (#5) in the next round. Londrina will play against the league's second-placed Campo Mourao (#2) and it may be a tough game between close rivals. Important game to mention about took place in . Second ranked Campo Mourao (8-5) saved a 3-point victory on the road edging 4th placed Cerrado (6-7) 91-88 on Monday evening. American guard Willie Mangum-IV (185-93, college: E.Michigan) nailed 28 points, 7 rebounds, 5 assists and 4 steals for the winning side and Marciel Santos accounted for 12 points and 11 rebounds. Campo Mourao's coach Emerson Souza allowed to play the deep bench players in such tough game. point guard Patrick Vieira (186-93) came up with a double-double by scoring 25 points, 10 rebounds and 4 assists for Cerrado in the defeat. Campo Mourao have a solid series of four victories in a row. They maintain second place with 8-5 record behind leader Londrina. Cerrado lost fourth consecutive game. They dropped to the fifth position with seven games lost. Campo Mourao will play against league's leader Londrina on the road in the next round and it will be for sure the game of the week. Cerrado will play against UniFacisa (#4) and it may be a tough game between close rivals. The game in Rio Claro was also quite interesting. Fourth ranked Sao Paulo FC (7-5) played at the court of 6th ranked Rio Claro (5-7). Sao Paulo FC managed to secure a 6-point victory 89-83 on Tuesday. Anderson Rodrigues fired a double-double by scoring 19 points and 10 rebounds for the winners. Korie Lucious produced 19 points and 7 assists for lost side. Rio Claro's coach Gustavo de Freitas rotated ten players in this game, but that didn't help. Sao Paulo FC moved-up to third place. Loser Rio Claro keeps the sixth position with seven games lost. They share it with Pato Basquete. Sao Paulo FC will meet at home Pato Basquete (#7) in the next round. Rio Claro will play against Blumenau and it may be a tough game between close rivals. Seventh ranked Pato Basquete (5-7) beat at home 8th ranked Blumenau (3-9) by 8 points 74-66, which is the biggest margin this round. Worth to mention a great performance of Rafael Castellon who helped to win the game recording 21 points and 7 rebounds. Pato Basquete's coach Carlos Magno used a ten-player rotation which allowed the starters a little rest for the next games. Pato Basquete moved-up to sixth place, which they share with Rio Claro. Blumenau at the other side stay at the bottom position with nine games lost. Pato Basquete's next round opponent will be higher ranked Sao Paulo FC (#3) on the road and it will be quite challenging to get another victory. Blumenau will play against Rio Claro (#6) and it may be a tough game between close rivals. The most impressive stats of the last round was 15 points and 10 assists by Alexandre Pinheiro of Pato Basquete. The most surprising game was a loss of top-ranked Londrina (9-4) on the court of fifth ranked UniFacisa on Monday night. Visitors were edged by UniFacisa 82-81. It ended at the same time the two-game winning streak of Londrina. They outrebounded Londrina 37-22 including 25 on the defensive glass. American point guard Nate Barnes (178-90, college: Alders.-Broad.) stepped up and scored 21 points and 5 rebounds for the winners and his fellow American import forward Reggie Larry (198-86, college: Boise St., agency: Pro Sports) chipped in 13 points and 10 rebounds. Four UniFacisa players scored in double figures. At the losing side forward Everton Oliveira (203-93) responded with 18 points and 6 rebounds (perfect from the field making all eight shots !!!) and Argentinian point guard Stefano Pierotti (185-98) scored 18 points and 4 assists. UniFacisa (7-6) moved-up to fourth place. Londrina at the other side still keeps top position with four games lost. UniFacisa are looking forward to face Cerrado (#5) in the next round. Londrina will play against the league's second-placed Campo Mourao (#2) and it may be a tough game between close rivals. Important game to mention about took place in . Second ranked Campo Mourao (8-5) saved a 3-point victory on the road edging 4th placed Cerrado (6-7) 91-88 on Monday evening. They outrebounded Cerrado 48-33 including 35 on the defensive glass. American guard Willie Mangum-IV (185-93, college: E.Michigan) nailed 28 points, 7 rebounds, 5 assists and 4 steals for the winning side and Marciel Santos (200-91) accounted for 12 points and 11 rebounds. Campo Mourao's coach Emerson Souza allowed to play the deep bench players in such tough game. Point guard Patrick Vieira (186-93) came up with a double-double by scoring 25 points, 10 rebounds and 4 assists and Danilo Sena (195-99) added 18 points and 4 assists respectively for Cerrado in the defeat. Four Cerrado players scored in double figures. Campo Mourao have a solid series of four victories in a row. They maintain second place with 8-5 record behind leader Londrina. Cerrado lost fourth consecutive game. They dropped to the fifth position with seven games lost. Campo Mourao will play against league's leader Londrina on the road in the next round and it will be for sure the game of the week. Cerrado will play against UniFacisa (#4) and it may be a tough game between close rivals. The game in Rio Claro was also quite interesting. Fourth ranked Sao Paulo FC (7-5) played at the court of 6th ranked Rio Claro (5-7). Sao Paulo FC managed to secure a 6-point victory 89-83 on Tuesday. Sao Paulo FC looked well-organized offensively handing out 22 assists. Anderson Rodrigues (205-97) fired a double-double by scoring 19 points and 10 rebounds for the winners. American guard Jalen Jones (188-95, college: UT Arlington) chipped in 13 points, 8 rebounds, 5 assists and 4 steals. American point guard Korie Lucious (180-89, college: Iowa St.) produced 19 points and 7 assists and the other American import Cameron Tatum (200-88, college: Tennessee) added 15 points and 5 rebounds respectively for lost side. Four Sao Paulo FC and five Rio Claro players scored in double figures. Rio Claro's coach Gustavo de Freitas rotated ten players in this game, but that didn't help. Sao Paulo FC moved-up to third place. Loser Rio Claro keeps the sixth position with seven games lost. They share it with Pato Basquete. Sao Paulo FC will meet at home Pato Basquete (#7) in the next round. Rio Claro will play against Blumenau and it may be a tough game between close rivals. Seventh ranked Pato Basquete (5-7) beat at home 8th ranked Blumenau (3-9) by 8 points 74-66, which is the biggest margin this round. Worth to mention a great performance of guard Rafael Castellon (192-85) who helped to win the game recording 21 points and 7 rebounds. Point guard Alexandre Pinheiro (185-85) contributed with a double-double by scoring 15 points and 10 assists for the winners. Four Pato Basquete players scored in double figures. Pato Basquete's coach Carlos Magno used a ten-player rotation which allowed the starters a little rest for the next games. American guard Que Johnson (198-92, college: WKU) answered with 18 points and forward Jorge Iglesias (206-95) added 15 points in the effort for Blumenau. Pato Basquete moved-up to sixth place, which they share with Rio Claro. Blumenau at the other side stay at the bottom position with nine games lost. Pato Basquete's next round opponent will be higher ranked Sao Paulo FC (#3) on the road and it will be quite challenging to get another victory. Blumenau will play against Rio Claro (#6) and it may be a tough game between close rivals. Franca rallied past Bauru to open win count in the series. Worth to mention a great performance of the former international point guard Elio Corazza (193-89, college: Miami Dade CC) who helped to win the game recording a double-double by scoring 18 points, 6 rebounds, 10 assists and 5 steals. International forward Lucas Silva (209-95) contributed with 18 points for the winners. The former international power forward Lucas Mariano (208-93) answered with 22 points and 6 rebounds and the former international point guard Larry Taylor (185-80, college: Missouri Western) added 15 points and 7 rebounds in the effort for Paschoalotto/Bauru. Five Vivo/Franca and four Paschoalotto/Bauru players scored in double figures. Mogi das Cruzes outgunned Basket Caerense in the opener. Mogi made 22-of-22 charity shots (100 percent !!!) during the game. Worth to mention a great performance of the former international power forward Joao-Paulo Batista (205-81, college: Gonzaga) who helped to win the game recording a double-double by scoring 18 points and 13 rebounds. The former international Luis-Felipe Gruber (206-85) contributed with 14 points and 9 rebounds for the winners. The former international forward Felipe Ribeiro (201-79) answered with 19 points and 8 rebounds and Alex Oliveira (196-83) added 13 points and 7 rebounds in the effort for SKY/Basquete. Both coaches tested many bench players and allowed the starting five to rest. Flamengo cruised past Corinthians to take the lead. Flamengo outrebounded Corinthians 46-23 including a 35-19 advantage in defensive rebounds. They shot the lights out from three nailing 14 long-distance shots on high 56.0 percentage. Flamengo players were unselfish on offense dishing 22 assists. Worth to mention a great performance of Bahamas forward David Nesbitt (200-91, college: St.Thomas, FL) who helped to win the game recording 22 points. Argentinian point guard Franco Balbi (185-89) contributed with 7 points, 6 rebounds and 12 assists for the winners. Four Flamengo players scored in double figures. American-Peruvian point guard Kyle Fuller (185-92, college: Vanderbilt) answered with 25 points and Uruguayan point guard Luciano Parodi (182-94) added 16 points and 4 assists in the effort for Corinthians. Both coaches tested many bench players and allowed the starting five to rest. Botafogo stormed past Pinheiros to surge ahead in the series. Botafogo F.R. dominated down low during the game scoring 48 of its points in the paint compared to Pinheiros' 28. They looked well-organized offensively handing out 22 assists comparing to just 9 passes made by Pinheiros' players. Guard Caue-Borges dos-Santos (187-91) fired 18 points, 5 rebounds and 4 assists for the winners. American point guard Jamaal Smith (175-85, college: N.Mexico) chipped in 19 points and 7 assists. Four Botafogo F.R. players scored in double figures. American point guard Kenny Dawkins (175-87, college: Lamar) produced a double-double by scoring 17 points and 10 rebounds and the former international Betinho Nardi-Duarte (195-88) added 16 points respectively for lost side. Both coaches used bench players which allowed the starters a little rest for the next games.